You may know already that to hike means ‘to walk a great distance’ either for pleasure, training, or exercising. Usually followed by up, it also means ‘to move up out of place or position,’ or ‘to move or raise with a jerk.’ To hike can also mean ‘to increase suddenly.’ As a noun, a hike is a long walk and a sharp and unexpected increase. We often hike along the mountain trails in the summer. Tom noticed his shirt had hiked up and he tucked it back in again. The woman hiked up her skirts and waded into the river. The bank has hiked interest rates. Deborah always makes sure she takes weatherproof clothing and water with her when she sets off for a hike. The recent hike in the cost of raw materials means the manufacturer is going to have to raise the price of the product. In American football, to hike has another meaning: to take the ball from the ground and quickly pass it backwards, between the legs, to another player. Another word you may know for traveling a long distance on foot is trek. The main difference between a hike and a trek is distance and duration. A hike may take only a few hours (although many people go on hikes of a whole day or more), whereas a trek will be a long journey, undertaken over several days. 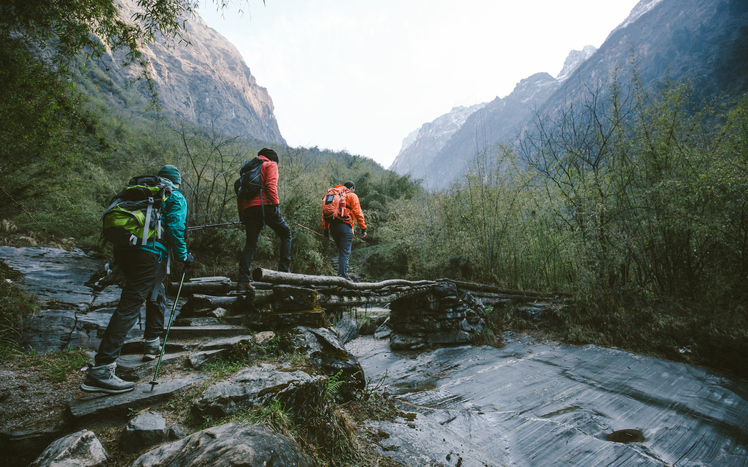 A trek may also be over more physically challenging terrain than a hike. However, there is no firm agreement, even between native speakers, of what exactly makes such a journey a trek rather than a hike and you may well find that some people will use hike where other people would use trek. Trek is not usually used for walks of only a few hours though. Hike, originally spelled hyke, dates back to the early 19th century. Meaning ‘to walk vigorously,’ its origin is uncertain, other than the fact that it evolved in dialect. Some linguists point to yike, another dialectal word that meant ‘to walk vigorously,’ and was used in the 18th century. Its meaning expanded to include ‘to go away’ by the mid-19th century. The other sense of hike, ‘to pull up sharply,’ dates back to the late 19th century, in US English. It may have evolved as a variant of hitch. Its sense expanded to include ‘to raise’ soon after. The noun comes from the verb, and was first used in the mid-19th century.